“The Impossible Dream” is back at the John W. Engeman Theater. 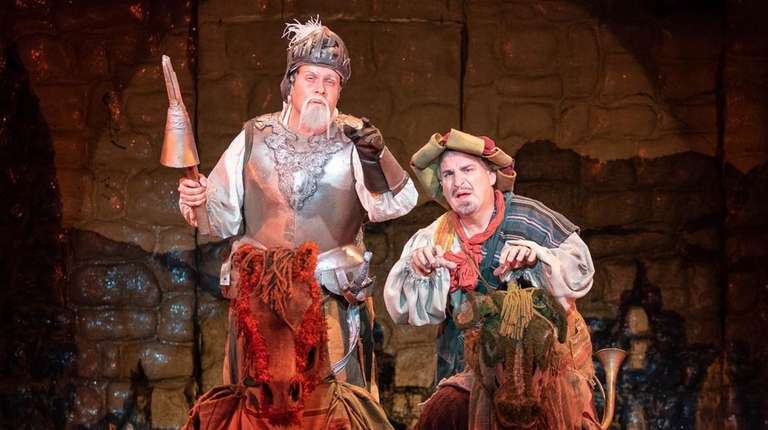 For the second time in ten years, the Northport playhouse is presenting “Man of La Mancha.” Once again, it’s directed by Peter Flynn. Note to all skeptics planning on catching a performance of this beloved classic: Please check your cynicism at the door. This production is that good. “Man of La Mancha, originally opened on Broadway in 1965 and was the recipient of five Tony Awards. Since then it has continued to dazzle theater-goers, both nationally and abroad. Written by Dale Wasserman, with music by Mitch Leigh and lyrics by Joe Darion, the script was adapted for the stage from the non-musical teleplay, “I Don Quixote, which was inspired by the writings of Miguel de Cervantes. For those unfamiliar with the storyline, “Man of La Mancha,” is a play within a play. It focuses upon Cervantes and his man servant, Sancho, having just been arrested and placed in a dungeon along-side murderers and thieves, as they wait their appearance before the Spanish Inquisition. Their crime? Foreclosing on a local Monastery. Their fellow prisoners taunt Cervantes when they learn he is a writer. Once they discover his treasured manuscript, a play about Don Quixote, they take it from him. In order to get it back, he challenges the prisoners to take on the roles and act the story out with him. Richard Todd Adams mesmerized the audience in his roles as Cervantes and Don Quixote, the madman whose goal is to be knighted and return the age of chivalry to late 16th Century Spain. Of course, he is considered “insane” for his beliefs, but the opinions of others don’t faze Quixote (the Man of La Mancha) one bit. He blithely goes about his goals: Fighting windmills and aiding damsels in distress. Mr. Adams is charmingly believable in both roles and his magnificent baritone voice rose magnificently to the heavens during each and every song he sang. It is the scullery maid and lady of the night, Aldonza, whom Quixote believes to be his special Lady, who may be his biggest challenge, though. He changes her name to Dulcinea (which means sweetness) and begins the work of convincing her how special she is. Not an easy task. This Dulcinea has led a life of such hardship that try as he does, it’s nearly impossible to convince her of her beauty and self-worth. This reviewer saw a production in which understudy Morgan Anita Wood filled in as Dulcinea, for the ailing Janet Dacal, who reportedly is coming back to the role. Understandably, Ms. Wood seemed nervous at the beginning of the performance. Quite frankly, she did not step up to the task, either acting-wise, or vocally. However, shortly into her performance, she relaxed and embraced the role with pure gusto. She deserves praise for her acting and singing ability. Her rendition of “What Does He Want of Me?”– in which she questions what Quixote could possibly see in her, was both touching and beautiful. Her angry, heartbreaking rendition of “Aldonza,” was also beautifully sung and was relayed with heart-wrenching emotion. The highest point of the evening was Mr. Adam’s resounding rendition of “The Impossible Dream” at the end of Act One. He had the audience in the palm of his capable hands. And, during ensuing reprisals of that song in Act Two, it was clear how much the audience appreciated his performance, as well as the presentations of the others who joined him in song. The ensemble cast moved from dungeon prisoners to participants in Cervantes’ play effortlessly. One of the stand-outs of the evening was Garfield Hammonds (Padre), whose stage presence and charm-filled performance deserves a special nod. Besides superb acting and singing by the entire cast, this production was well-served by the amazing scenic design of Michael Bottari and Ronald Case, as well as the effective lighting design of Alan C. Edwards and the costuming of Kurt Alger. “Man of La Mancha” runs through Oct.28.